The Version of the "Ma'asebuch." A legendary Jewish pope. 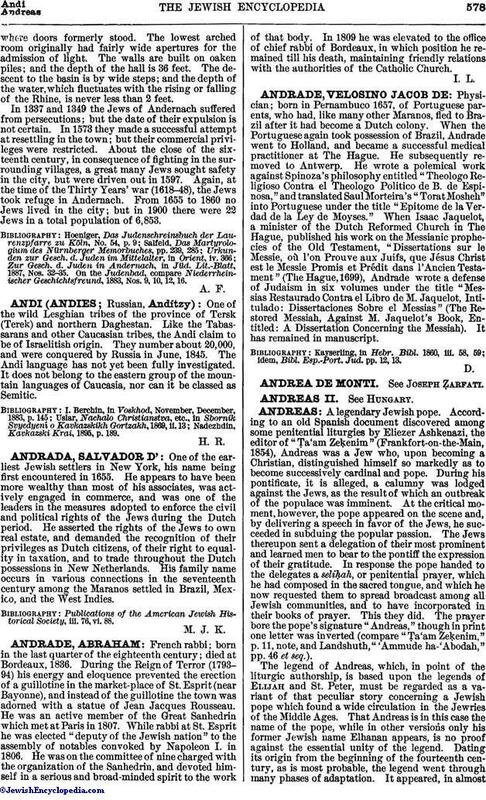 According to an old Spanish document discovered among some penitential liturgies by Eliezer Ashkenazi, the editor of "Ṭa'am Zeḳenim" (Frankfort-on-the-Main, 1854), Andreas was a Jew who, upon becoming a Christian, distinguished himself so markedly as to become successively cardinal and pope. During his pontificate, it is alleged, a calumny was lodged against the Jews, as the result of which an outbreak of the populace was imminent. At the critical moment, however, the pope appeared on the scene and, by delivering a speech in favor of the Jews, he succeeded in subduing the popular passion. The Jews thereupon sent a delegation of their most prominent and learned men to bear to the pontiff the expression of their gratitude. In response the pope handed to the delegates a seliḥah, or penitential prayer, which he had composed in the sacred tongue, and which he now requested them to spread broadcast among all Jewish communities, and to have incorporated in their books of prayer. This they did. The prayer bore the pope's signature "Andreas," though in print one letter was inverted (compare "Ṭa'am Zeḳenim," p. 11, note, and Landshuth, "'Ammude ha-'Abodah," pp. 46 et seq.). 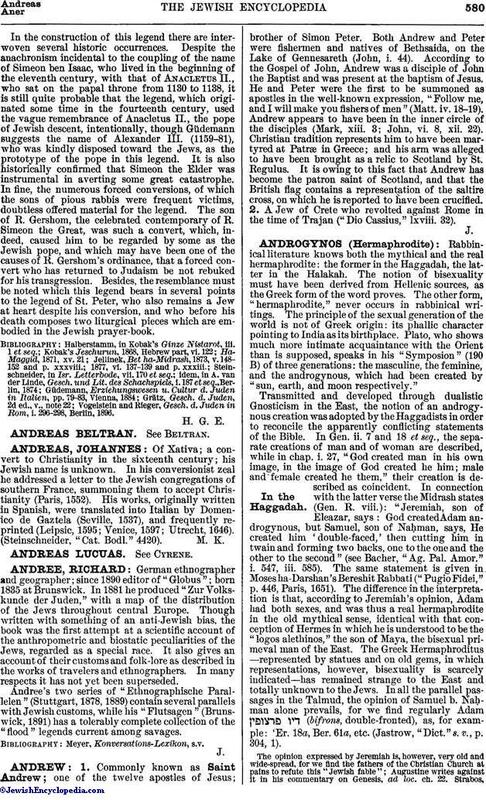 The legend of Andreas, which, in point of the liturgic authorship, is based upon the legends of Elijah and St. Peter, must be regarded as a variant of that peculiar story concerning a Jewish pope which found a wide circulation in the Jewries of the Middle Ages. That Andreas is in this case the name of the pope, while in other versions only his former Jewish name Elhanan appears, is no proof against the essential unity of the legend. Dating its origin from the beginning of the fourteenth century, as is most probable, the legend went through many phases ofadaptation. It appeared, in almostcomplete mythical dress, in a Passover poem attributed to one of the oldest German payyeṭanim, Simeon ben Isaac ben Abun the Great (or the Elder), who lived at Mayence about the year 1000. In the poem Simeon, whom popular genealogy was already eager to regard as a lineal descendant of King David, alludes quite incidentally to his son Elhanan. Elhanan—the legend runs—as a child is kidnaped by a Christian, who causes him to be baptized and to be given a good education. Owing to his energy and endowments, Elhanan rises very rapidly until he attains to the dignity of cardinal and, at length, to that of the papal chair. The new pope becomes the wonder of the world; and many princes and kings seek his counsel. The pope, however, grows sorely perplexed concerning his origin, seeing that, among the multitude of his distinguished visitors, there is none who would name himself as of his kin. This perplexity is aggravated by the doubts concerning the truth of the Christian religion which suddenly begin to assail the lonely pontiff. Ultimately he threatens his attendants with death unless they disclose to him the secret of his birth and descent. His subordinates then confess the truth, designating, however, his kidnaping as the will of God, who had chosen him that he might become the lord of all princes. The pope thereupon gives orders that Simeon, his father, be at once conveyed to him from Mayence. Upon the arrival of the latter he is minutely interrogated by the pope, who, in the course of the conversation, causes him to enumerate his children. Only after persistent pressure, however, is Simeon induced to tell the story of his lost child, Elhanan, and to mention several birthmarks on him. These serve to determine beyond doubt the self-identification of the pope. He discloses himself to his wonder-stricken parent, and expresses great anxiety to return to the faith of his fathers—a wish in which, of course, he is encouraged by Simeon. His conversion is told in tragic, if not somewhat melodramatic style. A convocation of the cardinals is ordered; the people are summoned to attend, and the pope addresses all from the top of a tower. In his address he denies the supernatural origin of Jesus and the truth of the Christian doctrines. The astounded bishops suppose that their lord has become insane; but he retorts that it is they who are insane in their beliefs. Thereupon he throws himself from the top of the tower and dies; and Simeon writes the Passover poem in his memory. Of somewhat later origin is another version of this legend, which is extant in a Hebrew translation of a Judæo-German original, and which has the "Ma'asebuch" (The Book of Tales) as its source. According to this account El-hanan is stolen on a Sabbath by a Christian maidservant, or according to others, by his teacher, a priest, while his parents are at the synagogue. He receives an ecclesiastical education and rises rapidly in hierarchic circles, until he becomes pope. All the while, however, he is perfectly cognizant of his origin and consanguinity, though the splendor and the majesty of his position keep him from disclosing his identity. Finally he is overcome by a craving to see his father, to which end he promulgates an edict of persecution against the Jews of Mayence, being certain that the latter would send delegates to him to plead for its revocation, and that then Simeon, as one of the most prominent men of his community, would doubtless be found. The pope does not miscalculate. In due time the delegates of the Jews of Mayence, headed by Simeon the Great (or the Elder), arrive at Rome. 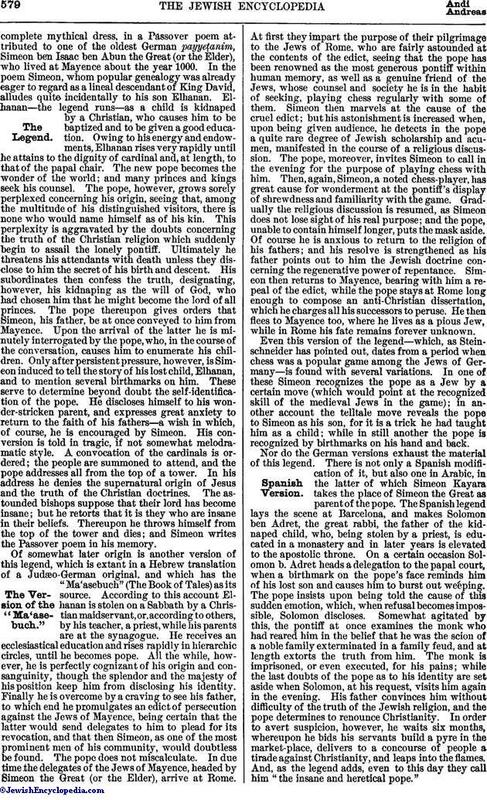 At first they impart the purpose of their pilgrimage to the Jews of Rome, who are fairly astounded at the contents of the edict, seeing that the pope has been renowned as the most generous pontiff within human memory as well as a genuine friend of the Jews, whose counsel and society he is in the habit of seeking, playing chess regularly with some of them. Simeon then marvels at the cause of the cruel edict; but his astonishment is increased when, upon being given audience, he detects in the pope a quite rare degree of Jewish scholarship and acumen, manifested in the course of a religious discussion. The pope, moreover, invites Simeon to call in the evening for the purpose of playing chess with him. Then, again, Simeon, a noted chess-player, has great cause for wonderment at the pontiff's display of shrewdness and familiarity with the game. Gradually the religious discussion is resumed, as Simeon does not lose sight of his real purpose; and the pope, unable to contain himself longer, puts the mask aside. Of course he is anxious to return to the religion of his fathers; and his resolve is strengthened as his father points out to him the Jewish doctrine concerning the regenerative power of repentance. Simeon then returns to Mayence, bearing with him a repeal of the edict, while the pope stays at Rome long enough to compose an anti-Christian dissertation, which he charges all his successors to peruse. He then flees to Mayence too, where he lives as a pious Jew, while in Rome his fate remains forever unknown. Even this version of the legend—which, as Steinschneider has pointed out, dates from a period when chess was a popular game among the Jews of Germany—is found with several variations. In one of these Simeon recognizes the pope as a Jew by a certain move (which would point at the recognized skill of the medieval Jews in the game); in another account the telltale move reveals the pope to Simeon as his son, for it is a trick he had taught him as a child; while in still another the pope is recognized by birthmarks on his hand and back. Nor do the German versions exhaust the material of this legend. There is not only a Spanish modification of it, but also one in Arabic, in the latter of which Simeon Kayara takes the place of Simeon the Great as parent of the pope. The Spanish legend lays the scene at Barcelona, and makes Solomon ben Adret, the great rabbi, the father of the kidnaped child, who, being stolen by a priest, is educated in a monastery and in later years is elevated to the apostolic throne. On a certain occasion Solomon b. Adret heads a delegation to the papal court, when a birthmark on the pope's face reminds him of his lost son and causes him to burst out weeping. The pope insists upon being told the cause of this sudden emotion, which, when refusal becomes impossible, Solomon discloses. Somewhat agitated by this, the pontiff at once examines the monk who had reared him in the belief that he was the scion of a noble family exterminated in a family feud, and at length extorts the truth from him. The monk is imprisoned, or even executed, for his pains; while the last doubts of the pope as to his identity are set aside when Solomon, at his request, visits him again in the evening. His father convinces him without difficulty of the truth of the Jewish religion, and the pope determines to renounce Christianity. In order to avert suspicion, however, he waits six months, whereupon he bids his servants build a pyre in the market-place, delivers to a concourse of people a tirade against Christianity, and leaps into the flames. And, as the legend adds, even to this day they call him "the insane and heretical pope." In the construction of this legend there are interwoven several historic occurrences. Despite the anachronism incidental to the coupling of the name of Simeon ben Isaac, who lived in the beginning of the eleventh century, with that of Anacletus II., who sat on the papal throne from 1130 to 1138, it is still quite probable that the legend, which originated some time in the fourteenth century, used the vague remembrance of Anacletus II., the pope of Jewish descent, intentionally, though Güdemann suggests the name of Alexander III. (1159-81), who was kindly disposed toward the Jews, as the prototype of the pope in this legend. It is also historically confirmed that Simeon the Elder was instrumental in averting some great catastrophe. In fine, the numerous forced conversions, of which the sons of pious rabbis were frequent victims, doubtless offered material for the legend. The son of R. Gershom, the celebrated contemporary of R. Simeon the Great, was such a convert, which, indeed, caused him to be regarded by some as the Jewish pope, and which may have been one of the causes of R. Gershom's ordinance, that a forced convert who has returned to Judaism be not rebuked for his transgression. Besides, the resemblance must be noted which this legend bears in several points to the legend of St. Peter, who also remains a Jew at heart despite his conversion, and who before his death composes two liturgical pieces which are embodied in the Jewish prayer-book. Vogelstein and Rieger, Gesch. d. Juden in Rom, i. 296-298, Berlin, 1896.